What makes for a happy customer experience? How can you better design a user experience that evokes happiness? What are the key elements you need to consider? There’s a broad set of influences and circumstances that are part of every customer experience. At face value, these elements fall into two particular categories: those that we perceive as predictable and feel a sense of having influence on and those that we look upon as unpredictable or uncontrollable. The latter includes elements like the kind of day a person is having and a host of many other factors that are often considered outside the realm of predictable aspects of a customer’s experience. There are also challenges associated with defining what “happiness” is. Once we are able to define it, how do we consciously apply it to better empathize with customers and design more meaningful customer experiences? How do we create interactions that leave the customer feeling not just satisfied but, rather, deliver an experience that provides the customer with the feeling of happiness? In the current edition of The New Yorker, David Owen provides a profile of HappyOrNot, the company that offers the ability to measure customer satisfaction through the use of simple terminals at the point of the actual customer experience. As an example, as customers left a chain of convenience stores, they were offered to rate their experience by pressing one of the terminal’s buttons labeled “very happy, pretty happy, pretty unhappy, or very unhappy.” The idea is that if one collects enough of the immediate responses to the question of whether – in the moment – the customer is happy or not, it results in enough data to discover what makes the customer happy, as well as what gets in the way. Still, in order to be successful, we need a definition for, and an understanding of, what human happiness is. In the simplest of terms, happiness is defined as a state of well-being and contentment, the result of a pleasurable or satisfying experience. Our happiness is the emotional informant of how we experience a product or service and how we ultimately determine the meaning and trust in the things we buy. This defines how we come to trust and become loyal to specific brands. For this reason alone, it’s important for us to know what the sources of happiness are and how we can use data, observation, and contextual inquiry to better understand and apply them. As human beings, defining what makes us happy is a natural pursuit. From the perspective that we are all, twenty-four hours a day, in one way or another, customers, the idea of happiness is at the center of our experience. As a way to better understand the sources of happiness, in the book True Alignment, I provide a framework for understanding, interpreting, and applying three sources of emotional fulfillment that make up what I call the customer code, which provides insight into the human desires for attention, competency and caring. On the upside, we are happy when our desires are being met. On the downside, we are unhappy when our desires are not being responded to. This also means that happiness exists when we do not feel a sense of fear that results from not getting our desires met. 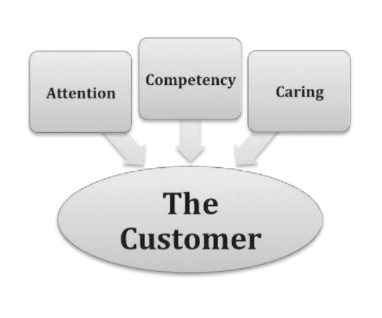 For this reason, it’s vital that we pay attention to the three customer desires and motivations: attention, competency, and caring. Attention fulfills our need to feel important and supports our desire to know that we count, that we matter. The opposite is to feel ignored. As customers, we interpret feeling ignored as not being valued or significant. This is a powerful psychological force and, as with most emotional responses, it is immediate. Think about the last time you called for customer service and went through several prompts before you got a person on the phone. The innovative design of chat and messenger are means through which services pay more immediate attention to the customer. It doesn’t take much for the lack of attention to get in the way of our happiness and leave us feeling anxious, upset, or angry. This is why it’s hard for even the greatest of brands to recover from ignoring the customer. It also explains why the connectivity afforded by social media has become such a dominant force in marketing. When it comes to the need for attention, our happiness is derived from feeling important and significant. It is also why we are more content when we are listened to and actually feel heard. Competency is the sense of control and emotional wellbeing that comes from feeling like we made the right decision. As part of our customer experience, we expect providers of products or services to be competent in creating and delivering whatever it is we’re spending our money for, including the level of reliability and quality we associate with it. As a result, we make comparisons about the quality, appearance, and associated pricing because we want to get the best value for our dollar, which allows us feel competent and in control. Whether we’re buying online or experiencing direct contact with a person making the transaction, we expect the experience to be designed in a customer-oriented and competent manner, allowing us to feel, and be, more successful. As customers, when we perceive we made a good decision, the source of happiness is feeling competent that we made the right choice. When we perceive that we made a bad choice, we feel incompetent and experience the anxiety that accompanies the embarrassment of making the wrong decision. We are left feeling stupid and that we failed. Not a good outcome for anyone, this feeling most often results in us trying to find someone to blame. When the expected competency is not provided, we are naturally disappointed and resent the provider for letting us down. Yet, ultimately, we question whether we were incompetent in making the actual buying decision. If we are fooled or make a bad decision, we no longer feel competent. Competency is a powerful source of happiness. Caring reflects the happiness and contentment we get from others treating us for who we are, fellow human beings. When we pay for a product or service, we expect our experience to be one through which we are treated with dignity and respect, and to get what we are promised. In this sense, our customer experience begins with how transparent and honest the provider is in marketing, advertising, and selling. Caring conveys that you’ll be truthful with me and that I can trust in how you offer and deliver to your promised customer experience. Unfortunately, all too often, we seem to have become accustomed to accepting less than we bargained for. We know that advertising is not always accurate and, more often, it tests the boundaries of truth and reality. Still, we expect that the makers and deliverers of the products or services that we want will inevitably do the right thing and come through on their promise. While truth in advertising is one example, environmental responsibility, fair trade, and social benefit are examples of how caring is experienced in broader ways. Along with our singular experience of integrity and trust, the failure to create a shared value is interpreted as a lack of caring about us as a community of customers and users, and our larger world. When it comes to caring, our happiness is measured by how truthful the product or service provider is. What they do is measured in terms of what is ethical and “right” and, ultimately, honest. At face value, data on customer happiness allows us to better understand an individual’s immediate emotional response and offers us insights and clues into an actual experience. It’s important to recognize how powerful contextual inquiry and the integration of data to human-centered design can be. To be successful requires us to have the ability to, first and foremost, be able to define what “happiness” is for our customers. Then we can more effectively apply our use of empathy to better understand the human desire that lies at the source of that happiness. It all points back to the commitment to inquiry and empathy. Once we are open to relating to one another’s perspectives, we can better understand our own. After all, the reason we spend every moment of our lives being customers is to pursue our happiness. It’s our human nature to do so. In Part Three of this series on understanding the customer experience, we’ll explore the alignment of brand intention to the design process.